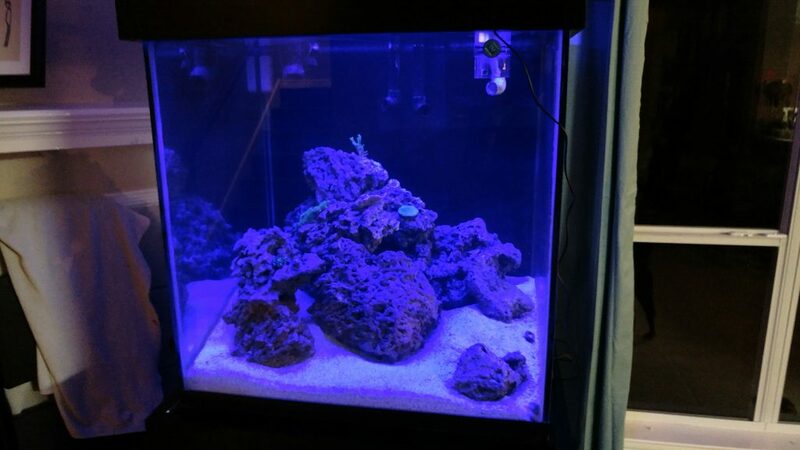 I bought a blue night-light for the aquarium. It’s a little 8″ LED light designed for smaller tanks. It’s just about perfect as a night-light on my larger tank. I think it might be a bit bright, so I’ll print some clips to cover part of the tube and limit the number of bulbs. Right now I have the light placed on the ledge of the aquarium pointing up at the reflector on the light. For only $10 it’s working really well. I’m pretty much leaving it on 24-7 as the main T5’s easily overpower it during the day. It keeps me from having to write any type of program for turning it on/off. It has a manual switch that I can reach up and turn it off if I need to. There are some other lights on in the room when I took this picture. It was hard to get the camera to focus with just the blue light on. Well. Besides the green star polyps that came in on the rock. 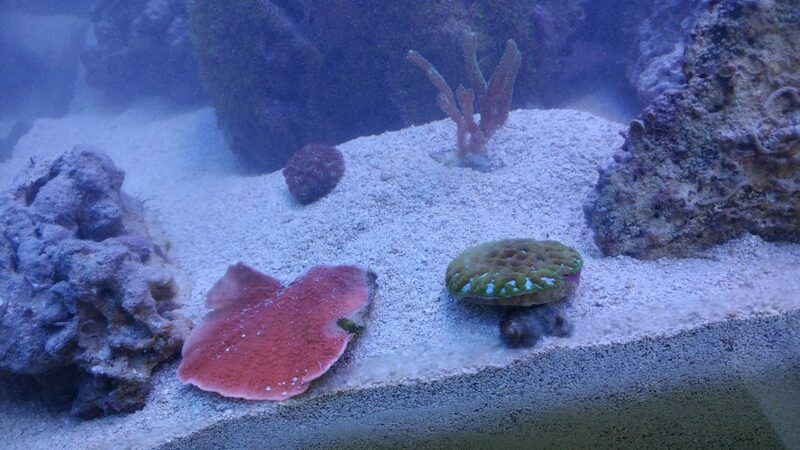 I walked out only spending $60, which you really can’t beat seeing that the corals were all almost 2″ in size. He said he wasn’t even planning on fragging the montipora, but one of his tangs got caught up in it and snapped some of the branches off. I think this is a pretty good start. I also worked on trying to get the wavemaker working. That thing is a pain in the arse to work on. It was really a bad design on my part. It’s still not working, but at least I have water flow out of all 4 pipes now to help move things around.